The old rectangle turned out to be a pretty good idea. Take a stack of papers, imprint each one, on both sides, with words and pictures, bind it all up, and sell it at a reasonable price. Printed books for children date back about 500 years (a fine article from a January 1888 of The Atlantic tells the story of the early years). Today, children’s books account for 37 percent of all books sold in the United States. In survey after survey, reading books shows up as a top activity for children from one to ten or eleven years old. About 70 percent of children in this age group read books for pleasure—compared with about 20 percent of adults. For most American children, reading books is a wonderful part of childhood. By age 14, many children find other ways to occupy their time. Out-of-date mandatory school readings don’t help matters—“A Catcher in the Rye” and “To Kill a Mockingbird” are dubious “must reads” for 21st century middle schoolers. Is the answer a newer rectangle? Perhaps a new style of novel with some sort of built-in social network? A book on an iPad with snazzy interactive features? Roughly 1 in 5 books sold in the United States is an eBook. Parents are interested in seeing their children read—so they buy lots of books, encourage literacy at every opportunity, and justify investments in iPads because these devices could encourage children to read more books, and spend more time reading. For some parents, that may seem reasonable, but 66 percent of teenagers read for pleasure–and they strongly prefer printed books! And yet, I can’t help but wonder whether traditional books offer one type of experience, and iBooks / eBooks / digital books provide another. (The usual argument: when home video became popular, the movie theaters did not go out of business.) I love the idea of reading a non-fiction book and AFTER my time with the book ends, I love to do a bit more research to learn more about the concepts that the author failed to discuss in detail. Do I need all of that in one digital package? Not really—I am fine reading the book in my comfy leather chair, then meandering over to the computer, or picking up the iPad, to learn more. But that’s a very narrow interpretation of what a digital book experience might be. For example, maybe a digital book is not a book at all, but a kind of game. Scholastic, a leader in a teen (YA, or Young Adult) fiction publishes a new book in each series at four-month intervals. The publisher wants to maintain a relationship with the reader, and the reader wants to continue to connect with the author and the characters. So what’s in-between, what happens during those (empty) months between reading one book and the publication of the next one in the series? And at what point does the experience (a game, a social community) overtake the book? NEVER! — or so says a Scholastic multimedia producer working in that interstitial space. The book is the thing; everything else is secondary. In fact, I don’t believe him—I think that may be true for some books, but the clever souls at Scholastic are very likely to come up with a compelling between-the-books experience that eventually overshadows the book itself. And what of the attics of the future? Your child—a grandpa with a dusty old attic in 2085—ought to have a carton filled with Rick Riordan stories and “Diary of a Wimpy Kid” that he can pass on to the young ones. He ought not mumble through some lame excuse about how every one of his favorite books was digital, and how those books were zapped from the cloud during the great digital storm of 2042. So do we leave it there? Children’s books ought to be printed and saved, placed on library shelves and in attic boxes for the ages? Not when there’s a new rectangle! Imagine a book that makes sounds and flashes pictures on command, that builds a bridge to the imagination in a way that enhances the experience of a parent reading a book to a very young child (or, an older one). Gee, this must be done carefully! We want to retain so much that is special and unique about the old ways—the ways that we have perfected over hundreds of years, and really managed to get right during the past fifty or one hundred—and yet, we’re raising a digitally native population. So far, 58 percent of children enjoy daily access to a tablet (often, an iPad). Much of what will be invented has been invented—at least until there is a massive new injection of innovation. Today’s tablet probably resembles the tablet of 2018, but it might be smaller, thinner, more flexible. What we have now is a reasonably stable rectangle. But what to do, for children, within its four digital walls? Last week, I spent a day pondering this issue with a few hundred people in the children’s book publishing industry at a conference called Digital Book World—the special section being entitled LaunchKIDS. Mostly, it was populated by people who work within the old rectangles, but remain curious about the new. Here and there, we learned about newer ones. Blloon (yes, it is spelled correctly) is encouraging people 18-34 (typically, less bookish than other populations) to subscribe to their service by using the number of pages read as a kind of currency (consumers pay for a certain number of pages, and engage in social activities to earn more). Google wants to “massively transform” the space (Google seems to say that about everything it sees or smells). Amazon is trying to make sense of analog vs. digital books, comparing the paradigm to hardcover vs. softcover books, for example. Of course, there are no easy long-term answers. Except one. Kids like books. And parents like to buy books for their kids. So far, that doesn’t seem to be changing very much at all. The four most popular children’s books (based upon Amazon’s sales—bookstore sales may vary). And, a popular Scholastic books into multimedia project, Spirit Animals. Not enough room in the suitcase? Maybe it’s time to ditch the travel guidebook and try the eBook version instead. I did, and learned a lot about what a traveler’s eBook ought to be. Travel guides are very different from other types of fiction and nonfiction books. They are only partially read. They are intensely used, but only for a few weeks. They are out of date shortly after they are published. And if you’re doing a lot of traveling, they can become quite heavy. An eBook on an iPad? Less weight. Full color. An opportunity to integrate with digital maps and Trip Advisor, build an itinerary, make reservations, maybe connect with chapters in history or nature books. Well, we’re not there yet, but we are seeing the beginning of a new era in travel guides. Lonely Planet has yet to make its big move into iPad publishing, but they offer one excellent idea: the purchase of individual chapters as PDF files for just under $5 a piece. For example, Lonely Planet’s digital England book can be purchased for $17.49, or you can buy the Devon & Cornwall chapter for $4.95. Either way, it’s mostly well-written text with very helpful guidance, plenty of links, and, take note, designed for iPhone with only with 2x magnification feature on. Fodor’s London Travel Guide is a full-featured app with plenty of maps, color images, lists with links, and easy access to places to visit, lodgings, restaurants, and nightlife. In fact, the app is organized so that it’s easy to read the text blurb about the London Zoo, then quickly refer to a restaurant map to find Lemonia, a highly-regarded Greek restaurant nearby. Read the description of Portobello Market, click, then there it is on a full-screen map. It’s easy to use and effective. 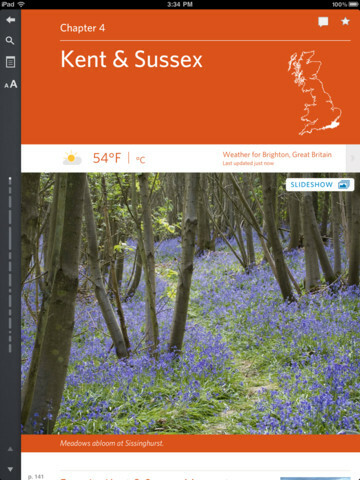 Working with an eBook design firm called Inkling, Frommer’s offers a more ambitious take on the digital travel guide. The eBook is organized in chapters, but each chapter begins with several points of entry: favorite moments in the region, a three-day trip, a five-day journey, favorite sites to visit, popular destinations in detail, and more. 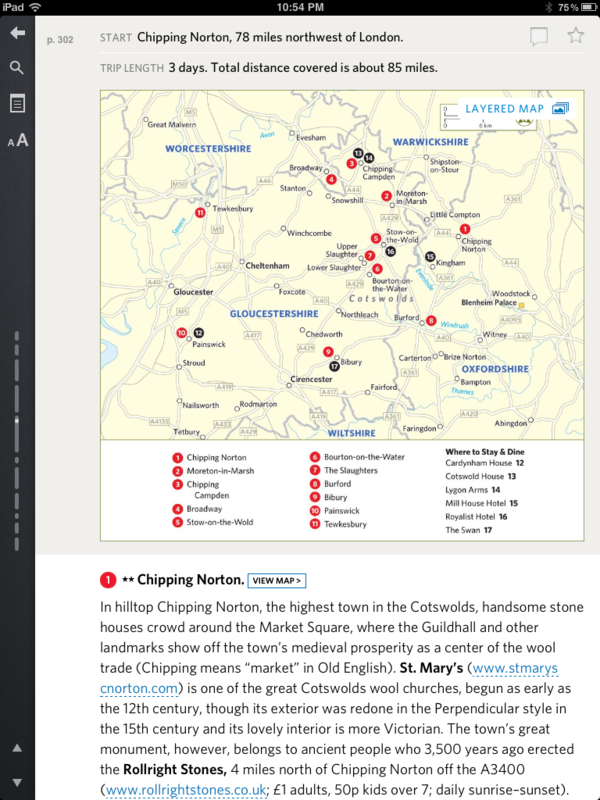 Choose the Cotswolds village of Moreton-on-the-Marsh and there’s a well-written description of the village, tips about what’s nearby, quick access to area maps, and an overall design that’s clearly designed for digital devices. This series is called “Day by Day”, so I expected an itinerary planner to coordinate with my iPad’s Calendar app. That’s not yet a feature, but I suspect it was discussed during this superior product’s design phases. I used all three guides, often and successfully, and never once missed the books that I did not carry with me. My favorite: Frommer’s. But I suspect that next week’s BookExpo will find publishers to introducing the next generation of interactive travel guides. What’s next? Certainly, full integration with Google Maps, Trip Advisor, Kayak and other reservations systems, Calendar, email. Those seem to be within reach, but they only scratch the surface of what could be done. There’s a gigantic social network opportunity here, whether it’s couch surfing or house swapping, or simply asking whether anybody in the Pembrokeshire area feels like taking a hike today. Right now, publishers are cautiously experimenting with books that become books on screens, but this caution may result in the demise of yet another industry. Travel publishers possess a unique opportunity to bring places to life, to involve community members (think Zagat’s but on a massive scale), to truly invent the future of publishing on a large, interactive scale. It’s interesting to contemplate whether this work can be done, or will be done, by travel publishers owned by much larger publishing conglomerates, or whether smaller, more flexible and potentially more innovative publishers will map this particular journey into the future.